An image of an equatorial armillary sphere, from Tycho Brahe's Mechanica. Tycho Brahe's reputation as the pre-eminent observational astronomer of the sixteenth-century derives from his construction and use of a range of astronomical instruments of large size and remarkable accuracy. Tycho's own descriptions of these objects are to be found scattered throughout his publications and correspondence, but the most detailed accounts are to be found in the Astronomiae instauratae mechanica (1598). This work reveals that Tycho developed and utilised four types of observing armillary. Initially Tycho designed a zodiacal armillary sphere, which could be used to obtain the ecliptic co-ordinates of celestial bodies (celestial longitude and latitude) directly, without any calculation. (His other observing instruments gave positions in horizontal co-ordinates). Tycho described the instrument as an improvement on the armillary spheres of Hipparchus and Ptolemy, because it utilised only four rings, rather than five or six. But he found that the accuracy of the instrument was compromised by distortions in the rings. One zodiacal armillary was remounted in equatorial form (see below) by 1581; however a passage in the Epistolae astronomicae (1596) implies that two of these instruments existed as late as 1591, although one had fallen out of use, so he must have constructed two or three. 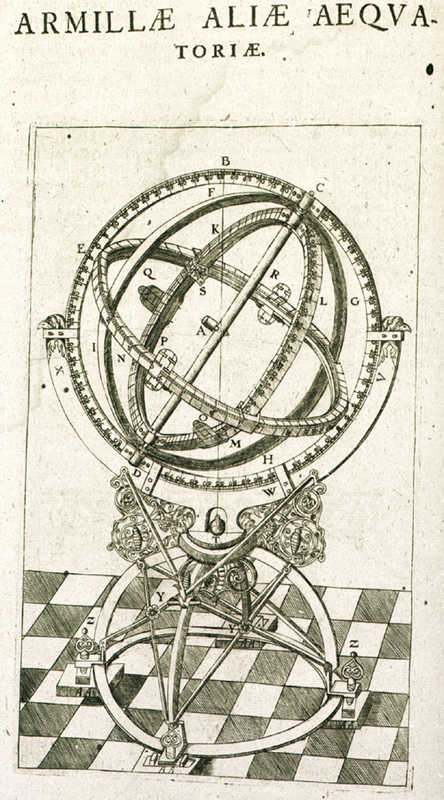 The equatorial armillary spheres were constructed to overcome the problem of the rings flexing or shifting under their own weight, and could be used to obtain the positions of stars in equatorial co-ordinates. Tycho had at least two of these instruments, which were composed of three or four rings. Subsequently, Tycho constructed a device he called "The Great Equatorial Armillary Instrument, Comprising One and a Half Circles." The one circle of this instrument was about 2.6 m in diameter, and was mounted on a self-centering axis. A fourth armillary instrument, also consisting of just one-and-a-half complete rings, was briefly described by Tycho as a portable instrument which could be used for observations in any co-ordinate system. All of these instruments were engraved using Tycho's transversal method, which allowed scales to be very finely subdivided , and were equipped with the sights he developed to eliminate parallax errors. Tycho was the last astronomer in the Latin West to make extensive use of armillary spheres for the purpose of observation. 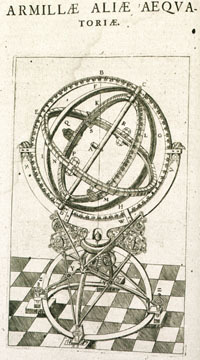 However, his Astronomiae instauratae mechanica exerted a strong influence on the Jesuit astronomer and missionary Ferdinand Verbiest (1623-1688), and as a consequence the Imperial Observatory in Peking was equipped with armillary spheres and other instruments based on Tycho's designs in the 1670s.